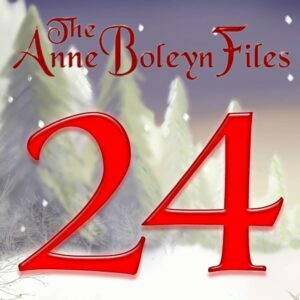 Sadly, it’s the final day of our Anne Boleyn Files Advent Calendar. I have one last Tudor treat for you, and it’s a yummy one. I do hope you’ve enjoyed the Advent Calendar. Do feel free to use it to get your Tudor ‘fix’ over Christmas by visiting days you’ve missed or by doing it all over again. All you have to do is click on the link in the cover image at the top of this website or go to https://www.theanneboleynfiles.com/advent2018/. A big thank you to those who contributed Tudor treats for our 2018 Advent Calendar and to Anne Boleyn Files followers for using the calendar. If you need a daily dose of Tudor history to keep you sane over the festive period then you can browse the archives here at the Anne Boleyn Files or have a look around the Tudor Society. Can’t believe this is the last day of Advent. Thank you and all those who gave to it for another fun and informative calendar. Merry Christmas to Claire, Tim, BQ, Christine and all those who post comments or in other ways contribute to this amazing website. May your Christmas be joyous, loving and in all ways positive. Merry Christmas to Claire and Tim, Michael and Christine and Globerose and everyone here and your families. Just finishing the cooking, it is looking fine. I remember my first yule log that I made in school with two or three bars of dairy milk chocolate and proper milk. It was great fun. The mix of mid winter festivals and our Christmas is quite fantastic. The yule log of course as the article explains used to be a log and burn for twelve days to signify the victory of the sun over the darkness. Tonight here is a very bright moon and clear skies. Despite the national forecast here we are in for some well overdue reasonably mild dry weather for a few days. I am looking forward to tomorrow and relaxing now as everything is ready. A very holy and happy Christmas to you all. See you all on Wednesday so have a good time. I’m just watching Scrooge with Alastair Sim had a slice of Tunis cake, it’s just lovely relaxing with Dickens classic Christmas tale. What is a Tunis cake? I love the Alistair Sim Christmas Carol, a bit spooky. I love the Muppet one as well. Happy Christmas. Tunis cake is just like a Madeira cake but with a coating of thick milk chocolate on the top, Mcvities made some lovely ones in the 80’s then they went out of production, they had coloured icing on top and marzipan fruits in the centre, some shops still do them but there not as good as Mcvities, I emailed them not long ago asking them to consider making them again, their quite an old dessert, yes the muppet Christmas Carol is funny and I like the musical with Albert Finney, though I think the Alister Sim one is more in keeping with the Dickens tale, hope you had a good Christmas to. Thanks Christine. Hope you are soon feeling better. Take care.